Kirstiekins Blogs: 12 years since the worst day. 12 years since the worst day. If you have seen the movie extremely loud and incredibly close then you will get the reference I made in the title of this post. The little boy refers to the events of 9/11 as the worst day, it isn't said from the outset but it is kind of given. The movie is very humbling, as it shows you how it effected people in the long run, either directly or indirectly. This movie, along with other 9/11 themed movies have been on TV a lot recently, due to the fact that today is the 12th anniversary of the terrorist attacks. I personally did not lose anyone when the planes hit the towers, but that doesn't mean it didn't effect me or my life. I remember my mum picking me up from school, and as usual she had a newspaper under her arm, however, today was different. Instead of some cheesy headline on the front there was nothing except that iconic image of the towers being struck. I didn't understand why someone could be so cruel as to do that to people that they didn't even know! How they could destroy someone's family, just because they wanted to make a stand or prove something! Didn't they realise that two wrongs don't make a right? Clearly not. But before this post becomes something that its not, I just want to say that I do not fully understand why/what happened, and I wish that in the future that I do not have to try and understand similar events. But I do give my deepest sympathies to anyone who was effected by this disaster, and all of my respect to anyone who has lost their lives fighting in the war that subsequently happened after. And lastly I wish that anyone who died in the attacks rests in peace. You will not be forgotten. Every September 11th the memorial lights are switched on at ground zero in order to remember everyone who was affected by the attack. 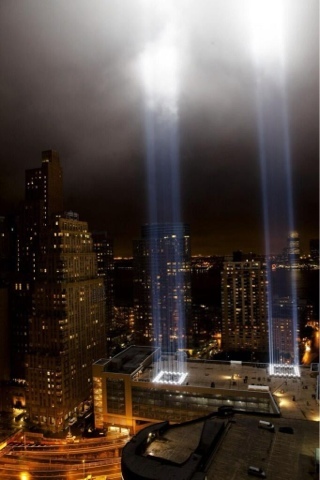 Lights that resemble the towers reach up into the night sky of New York in memorial of those that fell on that terrible day.